In an otherwise cataclysmic year marked by devastating natural disasters, the start of George W. Bush's second term as President of the United States, and Son of the Mask, the worst sequel to a great movie ever made, the Tide to Go Stain Remover Pen was far and away the best thing to come out of the year of our lord 2005. A pen! That erases coffee stains on your white Gap T-shirts! That makes it look like you've never dropped a forkful of spaghetti into your lap or dribbled red wine onto your silk slip in your life! It was a miracle — a tiny, trivial, ultimately meaningless miracle, but a miracle nonetheless. It has been proven throughout history that, when all hope seems lost, the littlest joys can make all the difference. And if two of them should happen to come in remarkably-similar pocket-sized pen form, like Tide to Go and Glossier's new Zit Stick? Well, that's just a coincidence. Launching tomorrow, September 6, on Glossier's website, the Zit Stick is the answer to all of — or at least one of — those times you wished you had the equivalent of a Tide to Go pen for more of life's little... spills (drunk texts, hooking up with an ex, breakouts, accidentally replying "You too!" to the airport employee who tells you to have a nice flight). The treatment, which will sell for $14, incorporates benzoyl peroxide, tea tree oil, and a slightly gentler derivative of salicylic acid, called capryloyl salicylic acid, all very nice, very reliable tried-and-true acne-fighting ingredients that you can find in countless spot treatments at varying price points at several points of sale near you. So what makes the Zit Stick different from other similar products on the market, aside from its resemblance to every red-blooded American's favorite on-the-go stain remover, is how well it layers over and under makeup. The unique antimicrobial steel-tip applicator features three little rollerballs, which glide onto skin without disrupting whatever is already on it. A few twists of the stick, which yields a satisfying "click," and you're ready to roll on a thin layer of the quick-drying translucent formula; ideal for midday moments of panic, it won't smear or wipe off the concealer you obviously already used to cover that zit. As with Glossier's Solution, which launched earlier this year, it is an act of charity on the part of a brand that proselytizes the allure of clear, unblemished skin that they also give you the tools it requires to get there. Armed with the Zit Stick, we can all be one step closer to having "Glossier skin"; armed with a Tide to Go pen, we can all create the illusion that we are the type of people who can leave the house in white jeans without fear. Now that would be a miracle. 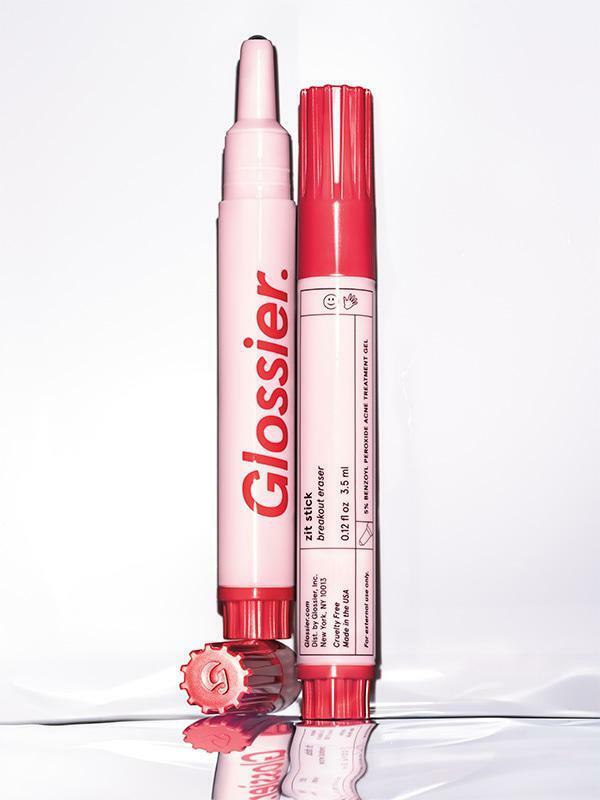 Glossier Zit Stick, $14, available at Glossier on September 6.